If there is one thing The Time Bum likes more than watches, it is cars. I have found that I admire many of the same traits in both: the precision machinery, sculptural beauty, and the inherent tension between form and function. In both cases, practical tools are elevated to become objects of desire. 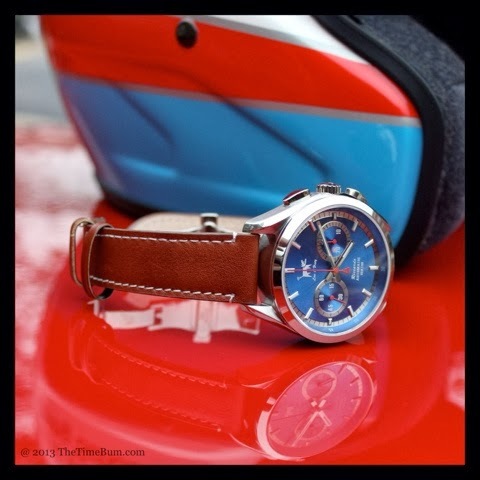 Watches and cars are not just complementary interests, they are inextricably linked through the history of motorsport where chronographs served as race timers for the teams and fashion statements for their smitten fans. Lew and Huey is one of the latest watchmakers to enter the world of motoring timepieces with the Riccardo, a mechanical chronograph described by its creator, Chris Vail, as "rally-inspired" in the tradition of the Rolex Daytona and TAG Heuer Carrera. 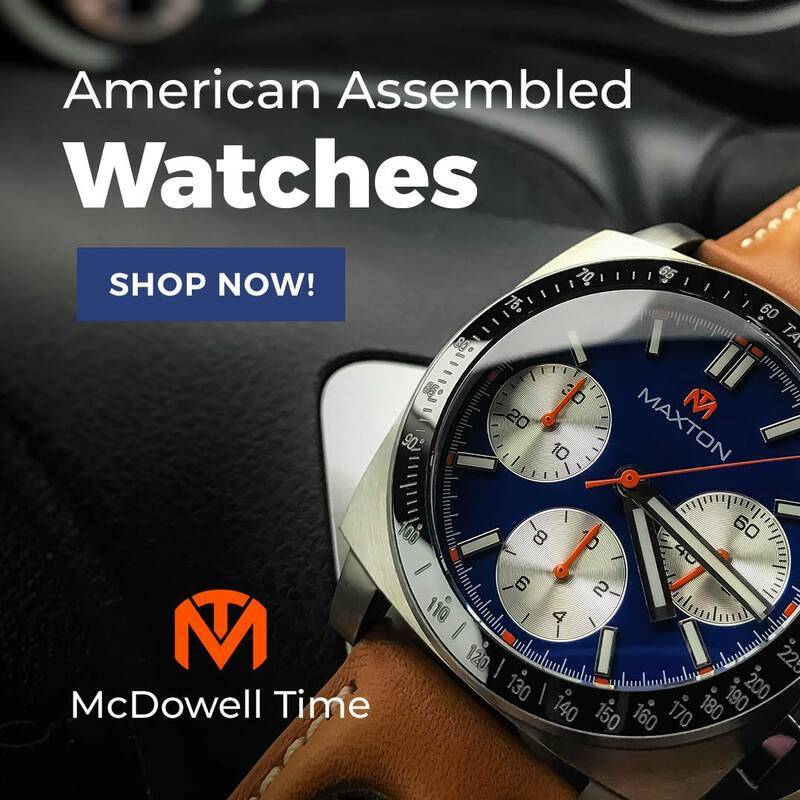 I have been watching the Riccardo with great interest in the Watchuseek Affordable Watch forum where Chris is an active participant, through its Kickstarter launch, to its delivery as a finished product. When he offered one for review, I jumped at the chance. Sadly, I was not able to secure a Daytona or Carrera to compare it to, and frankly, such a comparison would not have been fair to the $650 Riccardo (now available for $550). 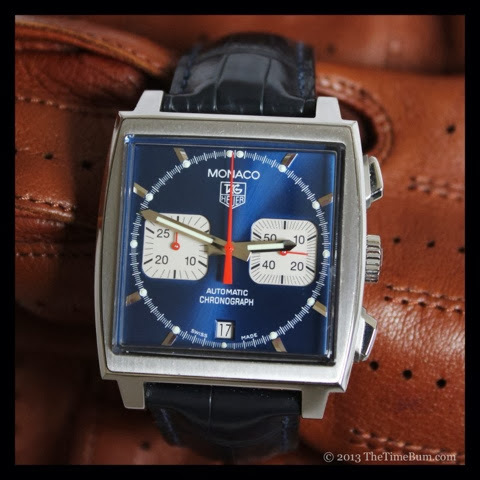 With its striking blue face and two sub-dials at 9 and 3, it is much closer to the iconic TAG Heuer Monaco, which in its current incarnation has an MSRP of $6,300. As luck would have it, I had access to one. It was time for a wildly unfair comparison test. The Monaco was introduced in 1969. 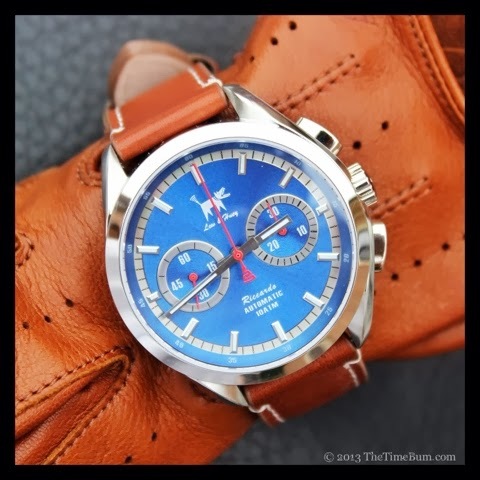 While it was named for the famous Formula 1 race, it is best known for the blue dial version on Steve McQueen's wrist in the movie LeMans. 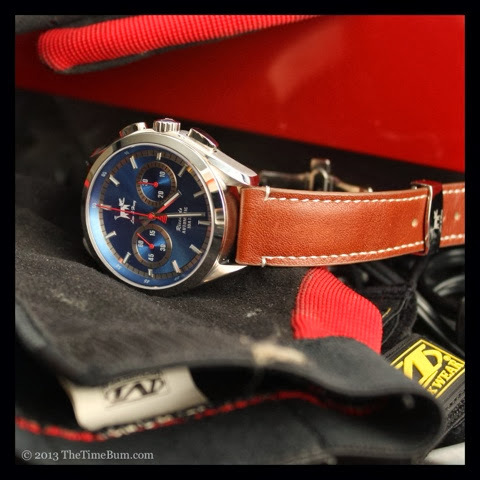 No mere prop, the watch was recommended to McQueen by legendary racer and Heuer spokesman Jo Siffert. It went out of production in the late 1970's but was reborn in 1997 with several updates. The blue dial version did not reappear until 2007. 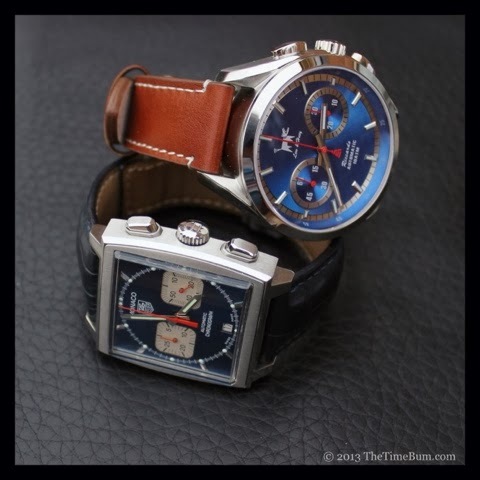 See the excellent TAG Heuer blog, Calibre 11, for a comparison between the original and the reissue. The watch has been updated even more since then, and the price has climbed to its current astronomical level. The watch used for this review is not the latest and greatest, but it is a 2007 reissue with a 38mm case, solid case back, and Plexiglas crystal. The name Lew and Huey is an Anglicized version of the Mandarin "luen huey," which means reincarnation or rebirth. Chris felt the phrase captured his life philosophy of second chances, essentially, that every dog has his day. Hence, the dog logo. While the watch is not named for any particular individual, Chris says it was inspired by famed driver Riccardo Patrese whose career in F1 spanned 16 years, and the tragic story of Riccardo Paletti who died in his first F1 start. Granted, it was not worn by a beloved celebrity, nor does it have a long and storied race history, but ascribing an advantage on the basis of product placement and celebrity endorsement feels like cheating. If Siffert had been sponsored by Timex and offered McQueen a Weekender, history might have been very different. The Riccardo is 42mm across with twisted lugs. The case is stainless steel with brushed sides. The bezel and upper surface are polished, creating a nice effect, particularly around the lugs, which are themselves a clever design detail not generally found on watches in this range. The watch is 14.5mm thick from the bottom of the case to the peak of its slightly domed, anti-reflective, sapphire crystal. The thickness is quite noticeable on the wrist and accentuated by the broad, flat sides. The size of the case is further heightened by the comparatively narrow 20mm lug width. It is a solid piece of metal on your wrist. Fit and finish is very good, with the exception of a rough patch under the crown. The review sample did have one significant flaw, the second had did not reset to 12 but instead rested just slightly past. This is a quality control flaw that cannot be overlooked, but from what I have read of other Riccardos in other hands, it is an isolated hiccup. If a purchaser were to discover this problem or any other for that matter, it would be covered by the one-year warranty. The 3:00 crown bears the Lew and Huey dog logo and like that of the Monaco, is flanked by two oblong pushers for the chronograph function. 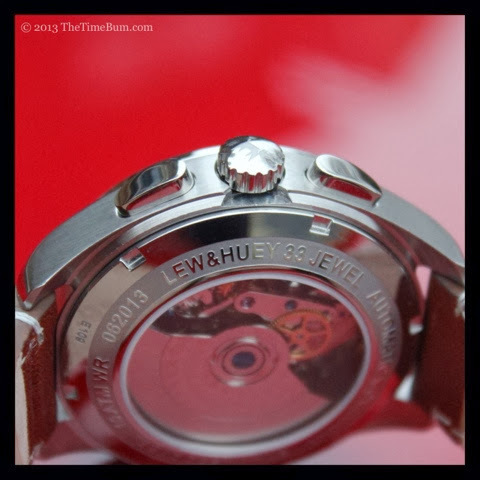 It screws down smoothly, but the action is a bit odd as it feels as if you are winding the watch as you do so. Flipping it over, you find a display caseback also of sapphire crystal, surrounded by an etched ring. The watch is rated for a very useful 100m water resistance. Because of its square shape, the Monaco is much larger than its 38mm width suggests and appears to be the same size as the Riccardo on the wrist. The case is brushed except for a beveled edge and the upper surface of the stubby, angular lugs. The case is chunky and purposeful but softened by a gentle bulge on its sides, breaking the otherwise uniform angularity. The side surfaces are flat and brushed like the Riccardo, but not nearly as thick. 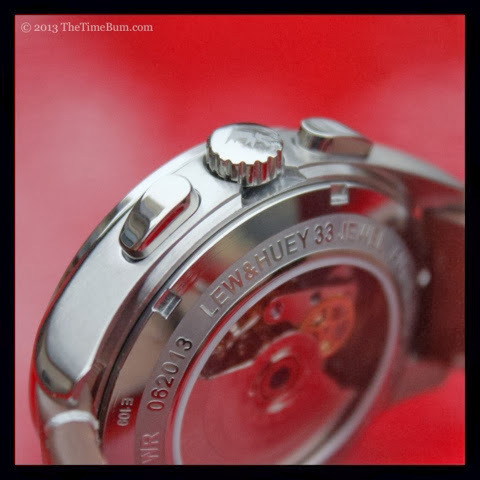 The 3:00 crown bears the TAG Heuer logo and screws down easily. This CW2113 model has a flat plexiglass crystal. 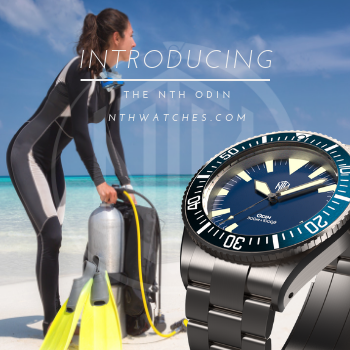 It is rated for 30m water resistance. Fit and finish are, of course, impeccable. 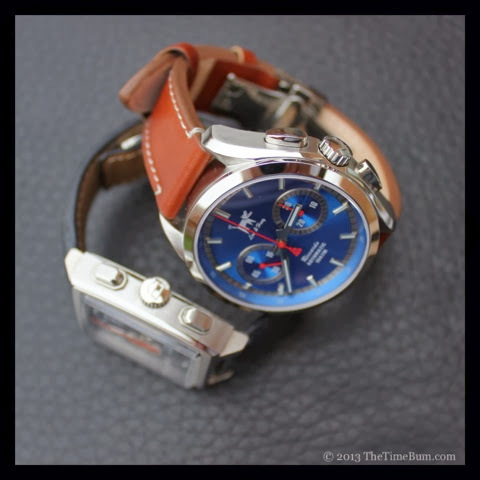 Both watches have large and lovely blue sunburst dials, although the TAG is the darker of the two. The layout is similar, with subdials at 9 and 3, and both watches repeat the shape of their primary dials in the subs, square for the Monaco, round for the Riccardo. Where the Monaco has contrasting silver subdials, the Riccardo has given a nod to the Carerra with silver chapter rings framing blue sub-dials, as well as the primary dial. The rings and the subtle texturing on the Riccardo's subdials are a visual treat. Both have red hands for the subdials and second hand. Both also use polished minute and hour hands filled with luminous material, and silver applied hour markers, although again, Riccardo bears more of a resemblance to the Carerra in this respect, with longer markers. The Monaco's are shorter, and due to the dial's shape, omits 12, 3, 6, and 9. Then, we get to the dog. Much has been made of the barking dog logo, and I was prepared to hate it, but I found it to be in good proportion to the dial. It occupies the space below 12:00 without dominating it, and it is unmistakably unique to the brand. Is it whimsical? Yes, and that is the point. This is not a watch that takes itself too seriously. Another fanciful touch is the serpentine tail on the second hand, mirroring the "wagging" tail of the dog. In contrast, the Monaco has a date window at 6:00 and exhibits no sense of humor whatsoever. This particular Monaco uses the TAG Heuer Calibre 17 movement, which is a modified ETA 2894-2. The Riccardo uses a 33 jewel, Sea-Gull ST1940, based on the 1950s vintage Venus 175. 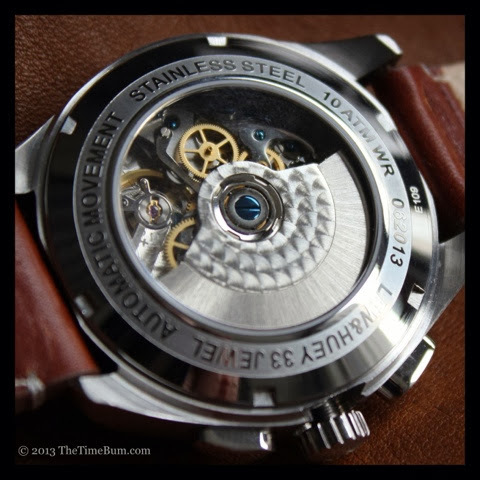 Is it really fair to compare a Swiss made, in-house modified movement to a Chinese made variant of an obsolete design? Of course not. That said, the ST19 is what makes mechanical chronographs affordable to bums like me. I have found ST19 variants to be accurate and reliable in my Magrette Moana and Sea-Gull 1963 chronographs and see no reason why the Riccardo would be any different. The fact that it brings mechanical chronographs down to a price point enjoyed by the common man makes it brilliant in my book. The Riccardo's movement is nicely finished, with blued screws. I understand the Monaco's is lovely too, but the CW2113 has a solid case back, so I will never know. Advantage, Riccardo. 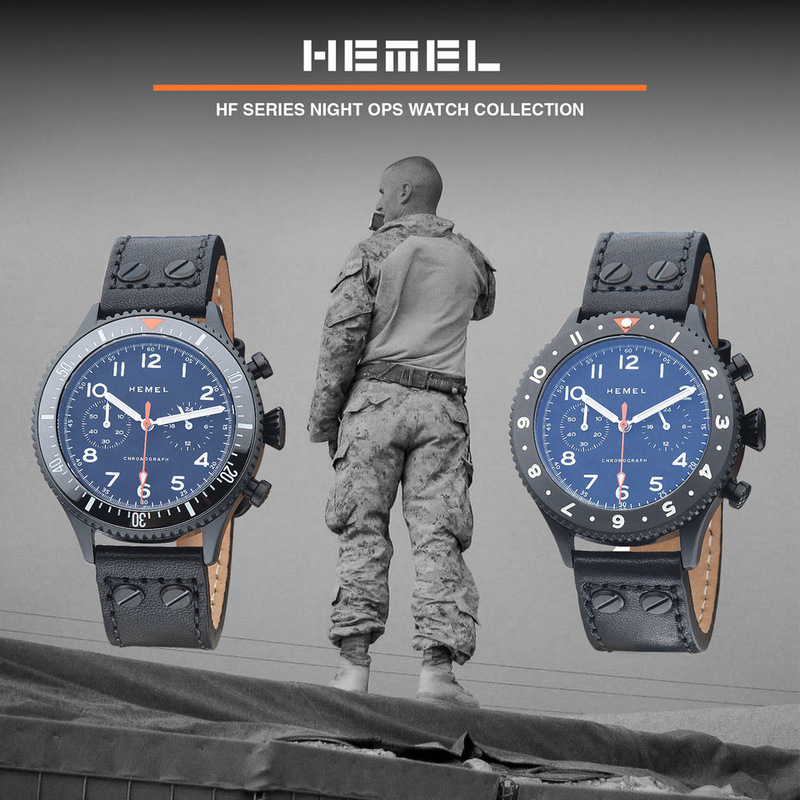 The straps on these watches share a deployant clasp, but that is about all. The navy blue crocodile on the Monaco is padded, tapered, finished in a matching navy stitch, and secured by a single-fold clasp. The Riccardo has a sportier tapered leather in British tan with a contrasting white stitch, secured by a butterfly clasp. It is a perfectly good strap, but to my eye, no match for the quality of the Monaco. I also prefer a single-fold to a butterfly. That said, the strap is a matter of personal preference and the single easiest and most inexpensive thing to change on a watch. 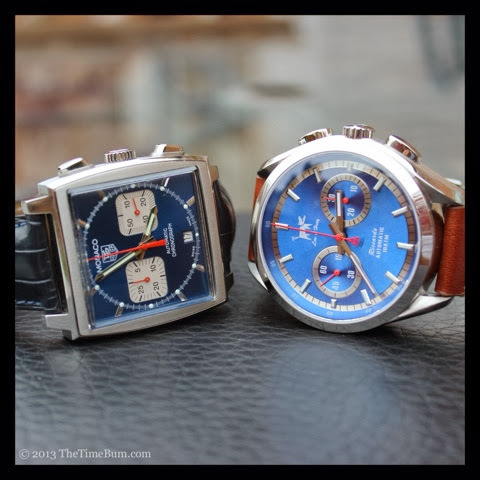 So all said and done, can the underdog Lew and Huey Riccardo match the iconic TAG Heuer Monaco? Of course not! The Monaco is a legend, made by one of the most respected brands in the business and costs thousands more. The very idea of comparing them is so insane, only a ticking Time Bum like me would even attempt it. But let me ask you this: how much do you plan to spend on your next watch? If you said $6,500, I would say that nothing but a TAG Heuer Monaco would do, and I would also ask what attracted you to my website. On the other hand, I'd hazard a guess that the majority of The Time Bum's audience is likely to spend under $1,000, or even under $500. In that case, I think you should give the Riccardo a good look. It is clear what inspired the Riccardo, but it stands apart as its own design, and a rather handsome one at that. Maybe it did not upset the heavyweight, but the Riccardo is a strong first effort by Lew and Huey. I can't wait to see what comes next. Pro: Nails the vintage racing look. Con: QC hiccup. Dog logo is not to everyone's taste. 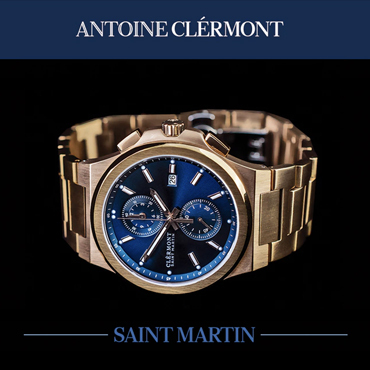 Sum: A mechanical chronograph that delivers the essence of the Monaco for thousands less.